… and everything in its place! A new kitchen should look amazing but at the end of the day, form follows function and it really needs to work as a space for cooking, eating and organising your food, pots, pans and other kitchen items. Storage is an important part of this and we think it’s just as important to have efficient, organised hidden storage solutions as it is to have an outwardly beautiful kitchen. We therefore offer a number of accessories and ideas that can help you keep your drawers and cupboards as organised on the inside as they are gorgeous to gaze upon from the outside because we all know that cooking is so much easier if everything we need is in a proper place. Drawers are an essential part of any kitchen and great for being able to access the full depth of the space when pulled out. While a large cavity can be really good for storing larger pans and ovenware, some organisation is required for storing smaller items – from really small things like cutlery and spice jars to larger items like bowls and plates. Drawer inserts such as plate tidies, shown here in the Linea Curve kitchen, or cutlery organisers here in the Savoy kitchen are great for keeping things separate and in its place. For something really fancy, and great for maximising space, how about this fabulous double drawer inner here in the Bramham kitchen? Wall cupboards really allow you to use space well but you always end up with difficult to reach spaces such as deep corners or high shelves. These nifty pull out units shown on the Linea kitchen mean that you can use all of the space and you don’t have to empty the contents of the cupboards to get to items at the back! 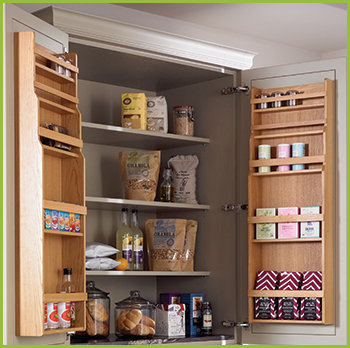 Cupboard space can also be at a premium so these door storage inners here on the Bramham and Salcombe kitchens allow you to have all your commonly used essentials to hand instantly. You will also notice that we have adopted the same approach to craftsmanship to these ‘hidden’ design features as we have to our ‘star of the show’ kitchens, using high quality materials, as we do with our carcases as well. That’s because we don’t believe in skimping on the bits of the kitchen that you can’t see – as some manufacturers choose to do. We think that high quality should extend to all areas of the kitchen. The drawer inners and kitchen cupboards often endure the most use so they need the same attention to detail and being a proud Yorkshire company, we definitely go along with the old adage ‘don’t spoil the ship for an ha’peth o’ tar’! Because we create bespoke kitchens according to your requirements, we can ‘mix and match’ various storage solutions and kitchen choices so you don’t have to compromise practicality for aesthetic appeal. Why not book a free design consultation to see for yourself?! 0 Responses to "Kitchen Trends Blog – May 2017"